NCSWCD has a spring and fall pond stocking program. 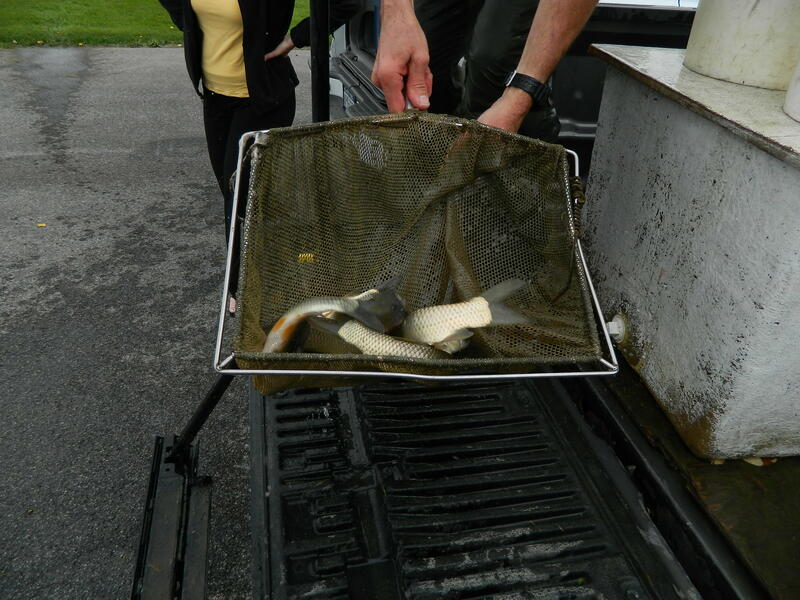 Each year, the District assists in providing fingerlings to area residents by coordinating delivery of stock to the District office located at the Niagara County Fairgrounds on Rt. 78. The program offers a variety of fish such as largemouth bass, perch, trout, bluegill, minnows and koi. Fathead minnows are also available for starting food chains in new ponds. Triploid Grass Carp for aquatic weed control are also available for purchase. You MUST obtain a stocking permit from the NYS Department of Environmental Conservation in order to obtain Grass carp from the District. NCSWCD provides a local link to nurseries for the purchase of various conservation items. An annual sale of deciduous and evergreen tree seedlings and transplants, shrubs, ground covers and grasses assists landowners with the establishment of conservation areas and the restoration of natural resources. Each spring, we package and distribute approximately 30,000 seedlings to provide landowners with economical plant materials for windbreaks, to establish wildlife food and habitat areas, for reforestation and to prevent soil erosion. If you would like to be added to the newsletter mailing list or email list, call our office, (716) 434-4949 Ext. 4. The Niagara County Soil and Water Conservation District purchased a Hiniker Interseeder to give farms the opportunity to plant cover crops into standing crops. The interseeder is a six row unit with a 30 cubic foot seed box that plants two rows of cover crops in between 30 inch rows of field corn. The cover crops can be planted into the corn at the v3 to v7 stage which allows the cover crop to sprout and start growing while the corn is small. Once the canopy of the corn closes, it shades out the cover crop and the growth of the cover will slow and stop until the corn is harvested or when the corn starts drying, allowing the sunlight to penetrate through the canopy to the cover crop. Typically, corn is harvested late in the year and there isn’t enough growing season remaining after harvest to allow the planting of a cover crop. The interseeding method gives the farms the opportunity to establish cover crops in these corn fields. It has been working great for planting cover crops between corn up to 18 inches in height. Some recommended cover crops that can be planted include annual rye grass, red/crimson clover or clover and tillage radish. The interseeder (as well as our no till drill) will help improve soil health by increasing organic matter, suppressing weed growth, preventing soil erosion and reducing the amount of fertiliz-ers needed in future growing seasons. If you are interested in trying the interseed-er on your field or would like more details, contact our office. A no-till drill is maintained and operated by our office, which is used for the establishment of wildlife habitat in the county. The drill is specially designed to install warm season and cool season grasses for enhancing our natural wildlife areas. The goal of grassland establishment is to provide habitat for the natural propagation of pheasants to expand the wild turkey range and populations, while also benefiting other grassland birds like the bluebird, bobolink and meadowlark, and other birds of concern in New York State. Many other species of wildlife will benefit from this type of wildlife restoration as well. Our office is involved in many ways to promote conservation education - through seminars, newsletters, and two major educational events sponsored each year. Since 1969, the Victor Fitchlee Conservation Education Park in Gasport has been the pristine location for the annual Environmental Conservation Field Days. This event for 5th and 6th grade students, classes rotate through the park to learn about topics ranging from water quality, forestry, conservation law and outdoor hobbies. In 2001, the District was presented the U.S.E.P.A Region 2 Environmental Quality Award for this valuable educational program that enriches the lives of over 1000 students every year. The Envirothon, an outdoor environmental competition for high school students, began in 1990. Working as a team to complete several exams, the Envirothon challenges students’ knowledge of soils, aquatics, forestry, wildlife and current issues, while enhancing th eir environmental awareness. Local winning teams move on to the State and National competitions to compete for prizes and scholarships. Teaching about our natural resources, and giving our children an understanding and appreciation of their environment is the best way to ensure our community will flourish for generations. If you are a teacher and would like to get your students involved, please call Darcy at our office, (716) 434-4949. 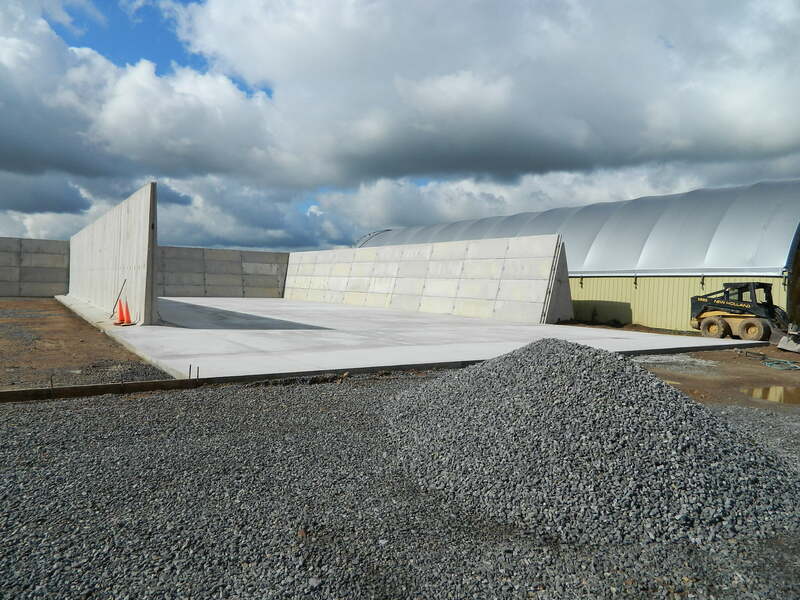 The Soil and Water Conservation District provides surface and sub-surface drainage assistance to all Niagara County residents, farmers and municipalities. We have assisted farmers with the survey, stakeout and design of countless tile systems which increase product yield and make it a little easier to be a producer in today’s difficult farming environment. Our office has also assisted municipalities by designing tile systems, ditches and diversions for golf course, baseball fields and numerous roads and waterways located within Niagara County. A hydro-seeder is maintained and operated by our office and is available to all municipalities. Any areas disturbed by ditching and drainage projects as well as sensitive environmental areas along the lake and creeks that have the potential to produce sediment-laden runoff can be hydro-seeded to quickly establish vegetation and reduce soil erosion. Highly erodible lands, such as the sledding hill at Bonds lake, and acres of lands along local watercourses and the lake have been hydro-seeded to reduce soil erosion, to stabilize banks and to protect water quality. Since its inception, the Soil and Water Conservation district has assisted in the development and management of countless ponds within Niagara County. Ponds can be constructed for fish production, fire protection, water for livestock and landscape improvement. Whatever the reason, it is important to have a good understanding of the factors that will make the difference between a beautiful pond and a big empty hole. Prior to construction, the district will evaluate the proposed pond location, water sources, soils and overflow drainage features to assure that a functioning pond is the end result. Private ponds have long been a tradition in American Culture. They beautify our landscape and are essential to aquatic wildlife enhancement. If you are looking to construct a pond on your land please speak to your towns assessor and get a tax map for your parcel. In order to set up a site assessment we need this map and our pond site suitability assessment form to be filled out and returned to the office with the $100 fee. Below is also a good reference document published by NRCS. It provides great examples and considerations when designing a pond. Agricultural Assistance is one of the main activities that the Soil and Water Conservation District is engaged in. With grants funded by N.Y.S. and the U.S. Department of Agriculture, we are able to assist farmers with the implementation of best management practices specifically aimed at controlling point and non-point source pollution. The Soil and Water Conservation District works in partnership with local farmers, the Natural Resources Conservation Service and the Farm Service Agency to deliver United States Department of Agriculture Farm Bill Programs. The Wetlands Reserve Program (WRP) and the Environmental Quality Incentive Program (EQIP) have been two successful ventures in Niagara County. With district assistance, the WRP program provides landowners the opportunity to establish long- term conservation and wildlife practices on their property. The EQIP program provides farmers with a voluntary conservation program that promotes agricultural production and environmental quality nation wide. This is accomplished by providing technical assistance, installation and implementation of structural and non-structural management practices. Our office is responsible for completing soil group worksheets for landowners applying for agricultural assessments. Eligible landowners can receive a reduction in the amount of their property tax bills for land in agriculture production by obtaining a reassessment of the property based on the defined value of the soils located at the property. The Niagara County Soil and Water Conservation District can assist with a variety of natural resource information. We are your one stop repository for Niagara County Flood Insurance Rate Maps, New York State and Federal Wetland maps, Soil Survey maps and Topographical Quadrangles. Our office is equipped with the most up to date aerial photography as well as the latest Geographical Information System (GIS) software and data, making natural resource planning and maps user friendly for all who are involved. Streambank erosion causes property loss and carries endless amounts of soil into our streams. It pollutes our water and results in the degradation of aquatic habitat and diminished navigability of our waterway. Our office has been very active completing structural and non-structural measures designed to protect critically eroding streambanks within Niagara County. In 2003, we partnered with Niagara County Department of Planning, Town of Newfane, Army Corps of Engineers and the Department of Environmental Conservation to protect the water and aquatic life of Eighteen Mile Creek. The Eighteen Mile Creek Restoration Project was designed to improve water quality and fish habitat in the creek, and make fishing a safer and more enjoyable activity. A quarter mile stretch of the creek just below Burt Dam was restored and the creek banks stabilized. Utilizing innovative techniques, the project was successful in removing debris, improving existing hiking trails, stabilizing eroded stream banks, improving fish habitat and reducing pollution. Eighteen Mile Creek has been designated as an Area of Concern (AOC) by the International Joint Commission under the U.S.-Canada Great Lakes Water Quality Agreement. The Niagara County Soil and Water Conservation District serves as the lead agency for the Remedial Action Plan Coordination and Management designed to de-list Eighteen Mile Creek as an AOC. This is being accomplished through strategic management of present and future creek remediation activities. One way this is being accomplished is through a county wide water quality monitoring program. The program is designed to collect water quality data to provide scientific evidence of water quality impairments to local areas of concern, which will enhance data used to prioritize local programs and update the NYS Department of Environmental Conservation Priority Waterbodies List. The Niagara County Soil and Water District is working for you and the environment. For more information on all district programs, Contact us at (716) 434-4949 ext. 4.